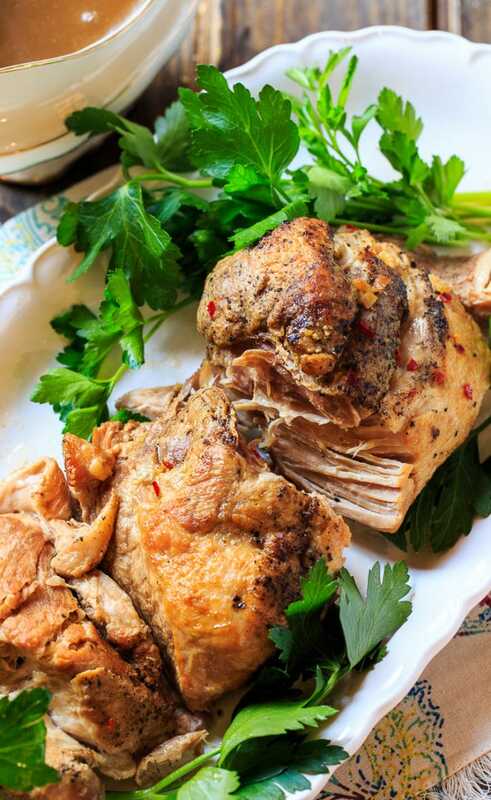 Slow Cooker Pork Loin cooks up slow all day in the crock pot. 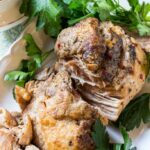 The slow cooker does all the work and at the end of the day you have a succulent and juicy pork roast that is fall apart tender. This recipe is one that I’ve adapted a little from Tricia Yearwood’s recipe in Home Cooking with Tricia Yearwood. It’s a convenient way to have a filling family meal on the table for a weeknight meal. Cook up some mashed potatoes and southern green beans to have yourself a blue plate special for lunch or dinner. You do need to spend a few minutes searing the pork before you put it in the crockpot for best results. And it takes just a few minutes to make a gravy at the end from the juices in the crockpot. Besides that, this is a very hands off recipe. It’s a mild gravy flavored with a little lemon juice and soy sauce, plus a touch of ground ginger and it tastes great served over mashed potatoes. Combine garlic powder, onion powder, pepper, red pepper flakes, and ginger in a small bowl. Rub mixture all over pork loin. Heat oil in a pan over medium-high heat. Add pork loin and brown on all sides. 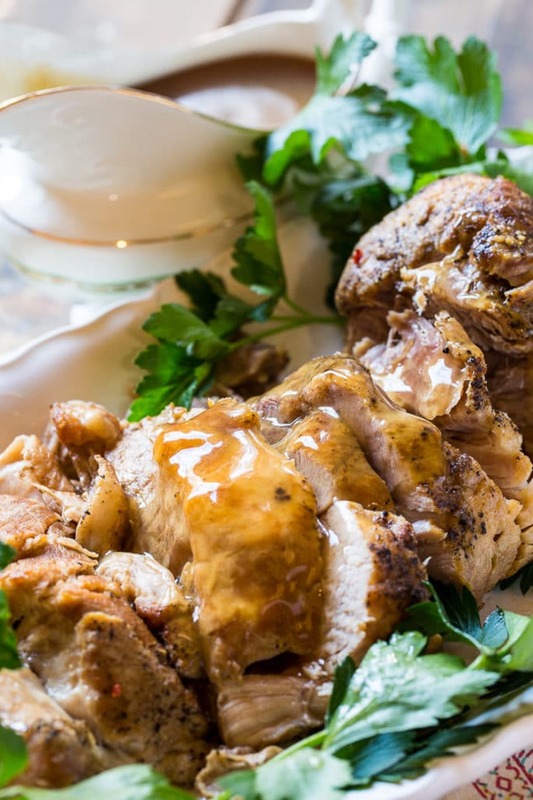 Place pork loin in a 6-quart slow cooker. 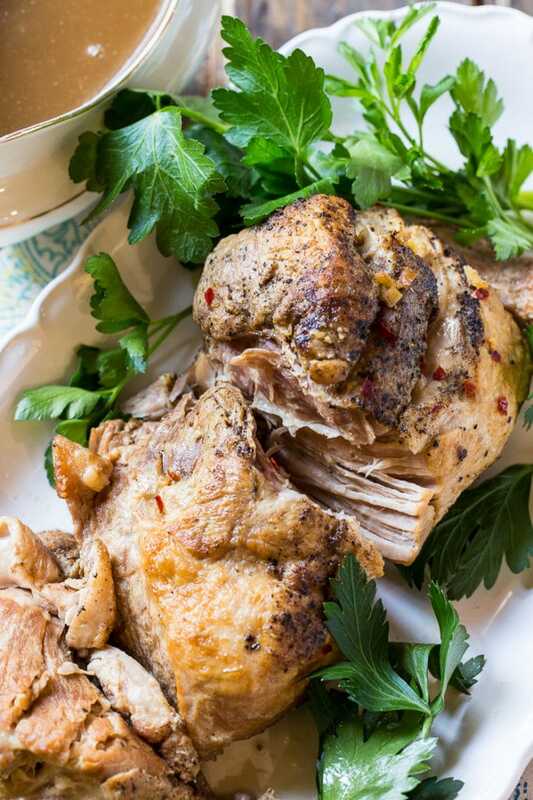 In a medium bowl or large glass measuring cup, combine chicken broth, lemon juice, and soy sauce. Pour mixture over pork. Cover slow cooker and cook on HIGH for 4 to 5 hours or on LOW for 8 to 10 hours. Remove pork from slow cooker and cover to keep warm. Pour liquid from crock pot into a large glass measuring cup. Skim fat off top and measure out 2 cups of liquid. Pour 1/2 a cup of the 2 cups into a small bowl and the remaining 1 1/2 cups into a small saucepan. If the 1/2 a cup in the bowl is still very hot, let it cool some, and then stir in the cornstarch. Pour cornstarch mixture into saucepan with the rest of the liquid and bring to a simmer, cooking and stirring until thickened. 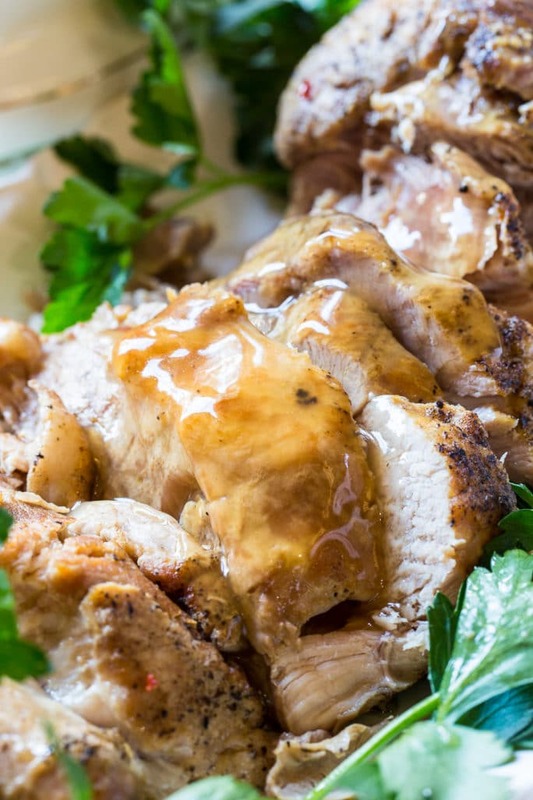 Serve gravy with pork. Instead of a pork loin, you could use a couple of pork tenderloins.